In Hawaiian, nā hale means “the houses,” a word that embodies the sense of traditional Hawaiian community. This word is the driving force behind the newly formed umbrella organization for Pacific Islander wellness and resources. HALE is an acronym for Health, Advocacy, Leadership and Education. Some of the strongest leaders of Utah’s Pacific Islander community came together to hatch the idea of Nā HALE. The idea was devised by members of the Utah Pacific Islander Health Coalition, the University of Utah Pacific Islander Studies Initiative, Margarita Satini from Utah Pacific Islander Civic Engagement Coalition and Charlene Lui from Hui Hawai’i O Utah Hawaiian Civic Club. The first formal meeting took place in January 2016. During that meeting, an exploratory committee was formed “to research different collaboration models, bylaws and articles of incorporation, and membership structures of existing organizations in other states,” said Jake Fitisemanu Jr. in an email interview. He is the acting chair of the steering committee that is tasked with preparing Nā HALE to become a more formal entity. He is also the council member for District 4 in West Valley City, Utah. In April 2016, the Utah Pacific Islander Health Coalition unanimously supported the proposal to create a statewide umbrella group. It was one month later that the name Nā HALE was chosen. Pacific Islanders have a strong sense of family and community, so it is only natural that many of the already formed Pacific Islander resource groups are some of the main collaborators for this project. In addition to the founding organizations, Fitisemanu said local groups including Queen Center, National Tongan American Society, Beyond Culture, Utah Pacific Islander Behavioral Health Association, Samoana Integrated Language Initiative, Southern Utah Pacific Islander Coalition, Pacific Island Knowledge 2 Action Resource and PEAU Artists Collective are all main members of Nā HALE. Charlene Lui, director of educational equity for Granite School Districts, is native Hawaiian and has lived in Utah since the 1970s. She and her husband, who is Tongan, have been very involved in the Pacific Islander community in Utah through various groups, such as Hui Hawaiʻi O Utah and the National Tongan American Society. Fitisemanu sees Nā HALE as a way to strengthen each individual organization’s capacity and reach. “This kind of network can facilitate resource pooling as well as information sharing; for example, a program that has been successful in the Samoan community might be more readily adopted as a best practice among the Tongan community. It also creates opportunity for more impactful civic engagement, when communities can band together and promote policies that are in the best interest of underrepresented communities,” he said. While Nā HALE is a solidified concept, it is still just that — a concept. The individuals who are working on this project also have full-time careers, which can make it difficult to dedicate extra time to Nā HALE’s formal creation. Despite this, the umbrella organization already has a strong presence in the Pacific Islander community. It was featured as a community-based initiative during the American Public Health Association conference in October 2016 in Denver and was introduced to national partners across the United States and the Pacific territories in May 2017 during a webinar hosted by the Native Hawaiian & Pacific Islander National Network in Los Angeles. A semi-weathered copy of Thoreau’s “Walden” is perched on the top shelf of an IKEA bookcase in Nick Harrison’s bedroom, next to a collection of guidebooks, a stack of old climbing magazines and a French pocketknife — the handle made from the trunk of a cork tree. Harrison’s name is engraved on the blade. Keep a clear mind. Visit a different continent. Finish Castleton painting. Push my physical limits. Change someone’s life for the better. Harrison, a 20-year-old student and a “liftie” at Alta Ski Area, grew up with the Wasatch Mountains in his backyard, inspired by their mystifying allure. But kids today don’t seem to see the outdoors the same way Harrison does. 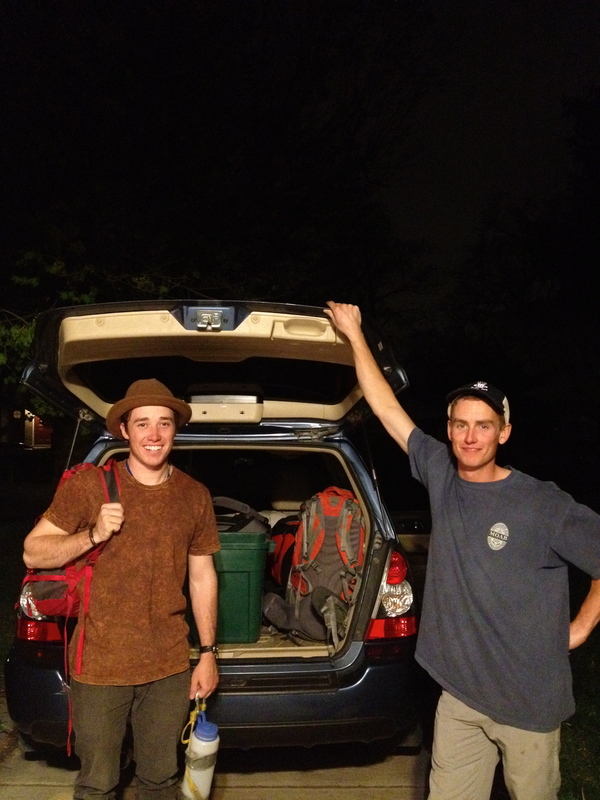 Crowson (left) and Harrison pack their car for a climbing trip in April. According to a national survey by the Kaiser Family Foundation, kids ages eight to 18 spend an average of 7.3 hours engaging in entertainment media in a typical day. This amounts to more than 53 hours per week. Be Out There — a National Wildlife Federation campaign that hopes to reconnect children to the natural world — notes that a study in 2005 revealed that children are spending half as much time outdoors than they did 20 years ago. Neil Crowson — Harrison’s roommate and adventurer counterpart — grew up down the street from Harrison, spending his childhood skiing in the Wasatch Mountains and rock climbing with his father. Both Harrison and Crowson say they have — in one way or another — been defined by their outdoor surroundings, that growing up with the mountains as their playground has given them a sense of place and purpose in a seemingly uncertain world. The walls of their living room are covered from ceiling to floor with personal photographs that share a common theme: being outside. The gear room in the basement of their bungalow-style house is crammed with racks of ropes, climbing gear, bikes, skis, backpacks, tents and camp stoves—and a looming odor that can only be created from years of adventuring outdoors. But that defining power of the mountains — of the outdoors in general — is becoming increasingly sparse among today’s youth, as an increasingly technology-fueled lifestyle drives kids indoors — and keeps them there. Outdoor Nation — a community-based program created by young people, for young people — was founded in 2010 to address the growing disconnect between today’s youth and the outdoors. Judy Brady, a licensed clinical social worker in Salt Lake City, said being outdoors is especially important for a child’s development because it fosters self-esteem. A series of studies published in a 2009 edition of Journal of Environmental Psychology found that being outside in nature makes people feel more alive. The sunlight also triggers serotonin and dopamine production, neurotransmitters that help maintain positive feelings in the brain, Brady said. Cases of seasonal depression are seen more often in the winter months because there is less sunlight and people spend less time outdoors. Allison Librett — a lawyer and fitness instructor in Salt Lake City — said that exposing her children to the outdoors at a young age has helped them establish and maintain relationships. Librett has a nine-year-old and an 11-year-old, both of whom spend their summers at outdoor camps with children of diverse abilities and backgrounds. Librett said that when her children spend long periods indoors — especially when they are on the computer or playing video games — she notices that they are much more anxious, emotional and frustrated. Those emotions disappear when her children are engaged in outdoor activities. Harrison said he hopes that today’s youth will realize what adventuring outdoors has to offer.